“Our internships are translating into great jobs with a real future for our students, who we match to paid internships in their chosen career fields with many of the nation’s best known employers,” said William Rafael Gil, Executive Director of the Hispanic Association of Colleges and Universities (HACU) National Internship Program, or HNIP. “Even in this slow economy, our results are tremendous in the number of college students placed, and the number of full-time jobs offered to our students at the end of their internships in the very career fields they want,” Gil said. HNIP, which has become the largest Hispanic college internship program since its inception in 1992, to date has provided internships to more than 4,400 top college students. Although Hispanic students make up the greatest majority of participants, HNIP is open to eligible students of any ethnicity. The summer session currently under way through August welcomed 447 new students from 26 states, Puerto Rico and the District of Columbia now on the job with 25 top corporations and federal agencies. The fall session begins in August. November is the deadline for students to fill out their online applications at www.hnip.net for the popular spring session, which begins in January. Word about HNIP apparently is out among savvy college students who know a diploma isn’t always enough to convince potential employers to open their doors in today’s uncertain economy. The HNIP web page now attracts an average 16,000 visits a month to an Internet site that offers exciting testimonials from former interns. “Prior to doing my internship with HACU, I never realized how many job opportunities were out here,” said Paola Felix, a former HNIP intern with the U.S. Department of Agriculture. “Today, I have a promising job with the USDA.” Susie Saavedra’s internship with the U.S. Department of Health and Human Services “prepared me for work in a fast-paced environment.” Today, Saavedra is a staff member for U.S. Senator Hillary Clinton of New York. HNIP matches a qualified applicant’s career interests with internship openings from dozens of partner federal agencies and private corporations that provide paid 10- or 15-week internships. The pay scale is based on grade level; i.e., graduate students earn more than sophomores. HNIP provides for travel and facilitates housing at internship sites throughout the country. “HACU staff takes the weight off our shoulders by finding the best travel schedule and accommodations,” boasted Ricardo Guadarrama, a former intern with the Veterans Affairs Administration. “The best part is that I have been able to travel throughout the United States,” said Norma Escobedo, a former intern for the Centers for Disease Control in Atlanta. Interns also are offered professional development and networking opportunities as part of their experience. Events have included breakfasts with members of Congress, career fairs, resume workshops, national conferences and formal receptions. Peer networking is a plus listed by many former interns who maintain their wide circle of intern friendships to keep abreast of career advancement trends and new job openings. “HNIP is unmatched at opening doors to rewarding career opportunities. Many former interns today are well-paid, full-time professionals as a direct result of their participation in this phenomenal program,” said HACU President and CEO Antonio R. Flores. HACU, which represents more than 300 colleges and universities serving the largest concentrations of Hispanic higher education students in the United States, established HNIP in 1992 to address the Hispanic employment gap in the federal workforce and in private sector management ranks. Hispanics today make up the nation’s youngest and largest ethnic population, but they also represent the only under-represented minority group in the federal labor force. HNIP is making a difference. A recent, independently researched report on the program labeled HNIP an “enviable” recruitment tool based on a consistently high rate of permanent job offers that are made following the internships. According to surveys of HNIP interns from the years 1993 through 2002, 59.4 percent of the internships ended with an offer of a job or paid fellowship; 31.8 percent said yes to those offers. HNIP internships match a student’s field of study and career goals to the needs of participating federal agencies and corporations. This summer’s employers include names as familiar as Target, Verizon, JP Morgan Chase, National Science Foundation, Environmental Protection Agency, Freddie Mac, Shell Chemical Company, the U.S. Department of Agriculture, Veterans Affairs, U.S. Department of Health and Human Services and the Federal Reserve Board. The internships are competitive. This summer’s interns, ranging in age from 17 to 49, have an average GPA of 3.41. Interns for the Spring 2003 session reported assignments ranging from creating sophisticated computer databases to hands-on strategy sessions with top government officials. Marvin Martinez, a student from California State University at San Bernardino who interned this spring with the National Institutes of Health, found himself networking in Bethesda, Maryland, with hundreds of corporate executives meeting with federal officials to discuss public-private sector business relations. LaDonna Groven of the University of Southern Colorado helped develop an employee operations procedures handbook during her spring internship in Richmond, Virginia, with the U.S. Department of Defense. Paula Williams of InterAmerican University of Puerto Rico at Bayamon helped create a spreadsheet on more than 500 marine pollutants and answered hot-line questions about the transportation of hazardous materials. “Boy, am I glad that I did not snooze in my chemistry classes,” she said of her Defense Department internship. Sari Buffil of Florida A&M University found it rewarding to network with professionals who feel “passionately” about their work with children during her spring internship at the federal Substance Abuse and Mental Health Services Administration. Priscilla Guzman of St. Mary’s University in Texas learned “that it is important to calmly deal with unexpected problems” when the SARS outbreak halted work on a normally routine international information exchange at the National Institutes of Health. Beda Gamboa-Padilla can add fundamental data analysis to her resume after a spring internship with the U.S. Office of Personnel Management. Yetune Abegunrin of the University of Maryland at College Park worked on experiments to find the most effective way to eliminate microbial contaminants in raw produce during an internship with the U.S. Food and Drug Administration. “war efforts” to his resume. “The USDA plays a particularly big role in the war by providing humanitarian aid to the people of Iraq, as well as to soldiers. It seems we all have an indirect role in the war,” Casarez said. 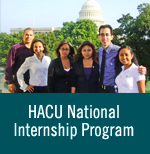 For more information about the HACU National Internship Program, visit www.hnip.net. Or contact HNIP Executive Director William Rafael Gil at HNIP offices in Washington, D.C., at (202) 467-0893.